The mysterious waters of our Earth are still brimming with possibilities of future discoveries and hide away treasures of the past, proven by a Viking “sea monster” found in the Baltic on Tuesday. 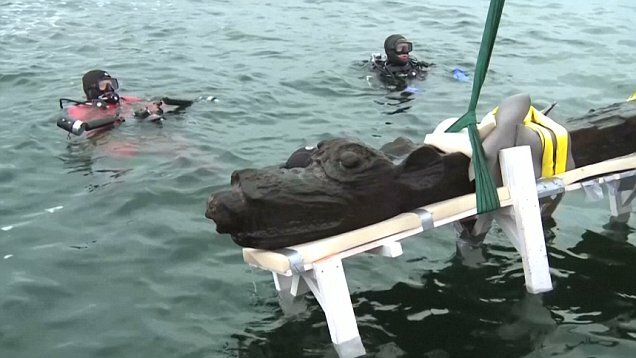 Just off coast from a town called Ronneby in the southern part of Sweden, the figurehead of a 15th century ship has been brought to surface by divers who inspected the wreckage. The beast features a hybrid sort of creature, that is quite unique to its time, but not uncommon for various cultures to carve in order to repel evil spirits. With a dragon-like shape, ears of a lion, a crocodile-like jaw and certain features of a rabid dog, it could’ve perhaps been just the right choice for believers. The monster recently brought out of the Baltic sea weighs around 660 pounds (300 kilograms) and was found lying at the front of an over 500 year old Danish ship. It was carved into a 11 foot long piece of wood and believed to have required quite ingenious methods at the time. It’s believed to have been a part of the Gribshunden, a Danish ship belong to the reigning king of that time, King John. Reportedly, in 1495, the Gribshunden sunk into the Baltic sea due to catching on fire while travelling from Copenhagen to eastern coast of Sweden. The rest of the ship was extensively damage and did not feature any other parts that might’ve been considered well preserved. However, the figurehead seems to have survived the flames and the half of century worth of lying on the sea floor. The good quality of the sea monster is believed to be due to the fact that sea worms are intolerant to the salt levels within the Baltic sea. So, it has made for the perfect place to find remnants of Viking ships, and not exclusively. Gribshunden is apparently loosely translated to “griffin-dog”, which might give a clue as to what the hybrid creature is. It’s quite a bit different from the trademark, serpent shaped figureheads that Vikings used to grace their ships and frighten away any malicious spirits. Armors and weapons found upon the wreckage were given to display in Danish museums, now part of an extensive history of a fascinating culture that has been the catalyst to many traditions, stories, books and movies still popular today.